Quite early in the assessment process, from a field of 240 commendable entries, each the result of professional passion, a single project emerged from the crowd to announce itself with a clear voice above all others. Subsequently, throughout a rigorous process, that project remained to become a unanimous, clear leader and as fresh as the new day. At the heart of the brief and throughout design and construction, Crofthouse presented new design ideas which offered a more sustainable future for the planet. The building sits in the landscape, rooting itself into the land, giving a wonderful sense of shelter. As architecture, this singular project has an exquisite, sensuous and biophilic beauty. it nurtures the soul. It springs from the earth to which it belongs; it works with nature; it is healthy and it indicates the future. – A simple timber framed building with materials selected for their local availability and built by local tradesmen. – With solar system installed, it will be autonomous with entirely independent building services. – The building envelope is insulated and sealed so that it can be heated and cooled passively. – Hydronic floor slab heating uses heat pump technology a fast growing tree copse, planted as a wind break, will also supply firewood. -Naturally durable building materials with minimal applied finishes; reducing maintenance. This thing, a building of real geometric beauty, is made out of a combination of painstakingly fabricated, exquisitely formed timber ring beams and dead straight sticks. These structural underpinnings are all made from ethically grown, eminently renewable wood, insulated between interior ply and exterior metal skins. The Crofthouse may be the introduction to a new architectural paradigm where man-made buildings do actually work in such a way with Nature that they actually work as one. 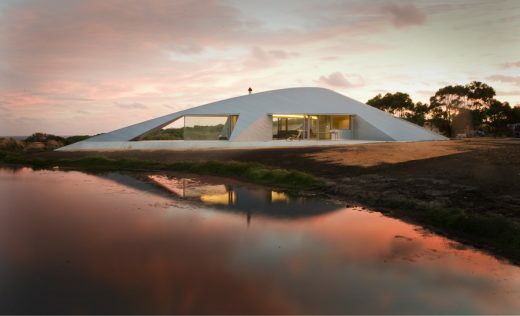 James Stockwell’s Crofthouse takes its place along an architectural continuum, following in the path of those to whom Nature is a canvas to be worked with, most famously travelled by Murcutt, Boyd and the Griffins.